If you want the easiest wired security type for outdoor use, or your house has been fitted with Ethernet cables, then outdoor PoE security cameras would be undoubtedly the best choice. In this 2019’s newest guide, you can check different types of outdoor PoE cameras, what features you should look into, and step-by-step guide to install your outdoor PoE surveillance cameras & systems. PoE stands for Powered over Ethernet. PoE security cameras are powered by single Ethernet cable (Cat 5 or 6 cable) for data transmission and power supply. 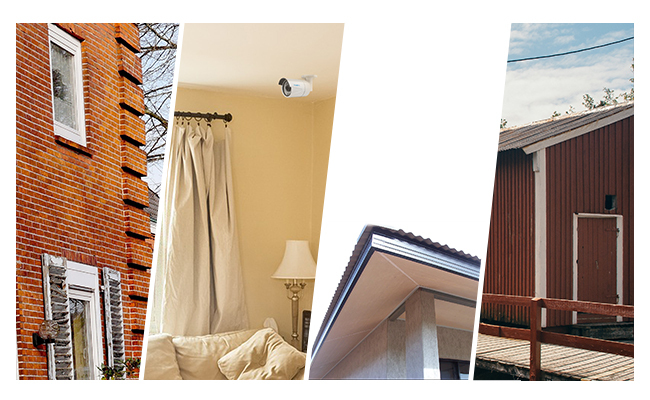 In terms of shapes, there are 3 main types of outdoor PoE cameras and systems available for your choice: bullet, dome & PTZ CCTV surveillance cameras. You can take a look at the below chart to get the overall impression on outdoor IP PoE security camera types. To make things easier, there are nice features worth looking into when choosing outdoor PoE cameras & systems. When you are searching for best outdoor PoE IP cameras and systems, it’s important to consider some of the nice features, like high definition, night vision, audio input etc. You can check the below important features in outdoor PoE surveillance cameras, which will benefit you in a long run. PoE outdoor cameras and systems should be able to capture clear images (with at least 1440p Super HD). 1440p exterior HD PoE cameras not only provide clear details such as the appearance of a stranger, license plate numbers, but also provide a true sense of security and peace of mind. And 5MP cameras, the upgraded version of 4MP outdoor PoE CCTV cameras, enable you to see even clearer details. Take RLC-410 5MP outdoor security camera with PoE as a typical example. You can watch the below video captured by this camera to see how clear the images can be. You can see a ship cruising in the sea captured by this PoE outdoor video camera from a long distance. You can even see the water wave super clearly. An outdoor PoE camera with a wide field of view (FOV) (over 80 degrees) helps covers large areas and reduces blind spots, especially the PTZ camera type. You can take a look at RLC-423 PTZ PoE outdoor home security camera. This camera can rotate 360°, so you can pan or tilt the camera to check any areas you want. For a large property, like your pool area, you can monitor such a wide-range area with just a single camera without spending money on multiple fixed cameras. A customer shared a video captured by Reolink RLC-423, you can see the gorgeous scenery below. The user checked the all-around environments near his house with this outdoor wired PoE IP camera. He can almost see the whole area with this camera, like the far-away forests, the blue sky, etc. via the pan/tilt function. Editor’s Note: In terms of wide-angle security camera, you should be cautious when choosing panoramic fisheye security cameras because fisheye security cameras could result in dramatic image distortion. It’s important to check outdoor PoE security cameras’ working temperature before your purchase. 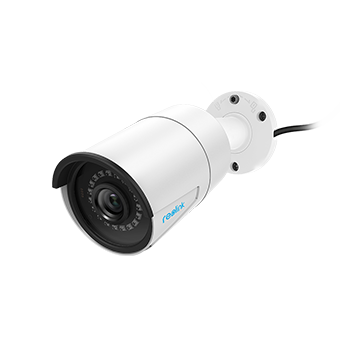 For example, Reolink RLC-410 outdoor PoE camera is designed to work in temperature between -10°C and +55°C (14°F to 131°F) with humidity ranging from 10% to 90%. Meanwhile, additional outdoor PoE security camera housing or enclosures could be helpful in such a circumstance. You can check more details in cold weather security cameras buying guide here. See how you can kill the extreme weather with your outdoor PoE IP cameras. A decent night vision PoE security camera (at least 30 feet) is normally packed with quality infrared sensors to detect ambient light, multiple IR LEDs to provide sufficient illumination even without additional light or street lamp, an IR cut filter to capture clear images and videos day or night. 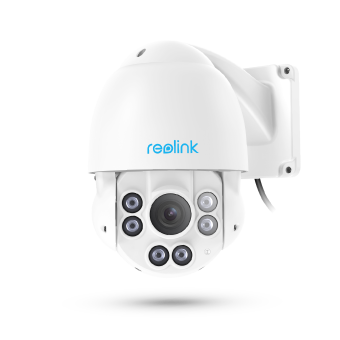 For example, Reolink RLC-423 PoE outdoor camera, packed with 6 infrared LEDs and IR cut filter, supports up to 190 feet night vision range. You can watch the below night vision video captured by this outdoor PoE IP camera with night vision to get more details. You can even see how many bricks the wall has at 9pm at a dark night in the video captured by this camera — as one of the best outdoor PoE security cameras with impressive night vision. Outdoor PoE security cameras with remote access enable you to check what’s happening to your home when you are in the office or travelling. For example, you can confirm that your package has been delivered to your home by take a look at your phone or computer. When someone knocks on your door, you can check who it is by a tap on your mobile phones without getting up from your sofa. 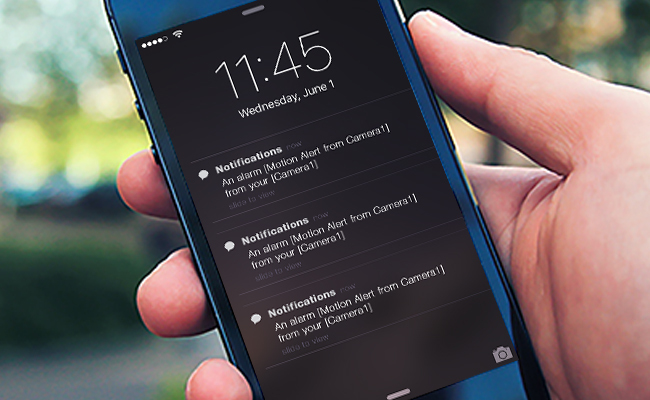 With motion detection and alert functions, you don’t need to keep staring at the screen or access the camera 24/7. You can only check your camera when your outdoor PoE security cameras sense motion and send you alerts. If any uninvited people approaches your home, you can get instant alerts before they break into your house. You can call the police for help before they enter your property. If you are planning to have PoE security camera systems installed outside like front door, back door, garage door, or out in the open exposed to the sun or rain, it’s inevitable to expose your PoE cameras to the elements. An outdoor PoE camera with IP rating 66 is rated for outdoor use and can withstand the impacts from solid matters like dust and liquids like rainwater. Meanwhile, outdoor PoE cameras, especially dome outdoor PoE security cameras are more vulnerable to smashing, damage or unexpected vandalism. You can choose a vandal-proof outdoor PoE camera with IK10 vandal proof so that your camera can stand firmly under external mechanical impact. You can also install your outdoor PoE cameras out of the reach or disguise them out of sight. If you want to listen to what’s going on and identify voices of people coming and going on premise, outdoor PoE security cameras with audio and video come in handy. So it’s essential to know all the rules and regulations on security cameras with audio recording so that you won’t land yourself a load of troubles. There are tons of choices when you buy outdoor PoE IP cameras, including expensive or cheap ones, big or mini types, etc. 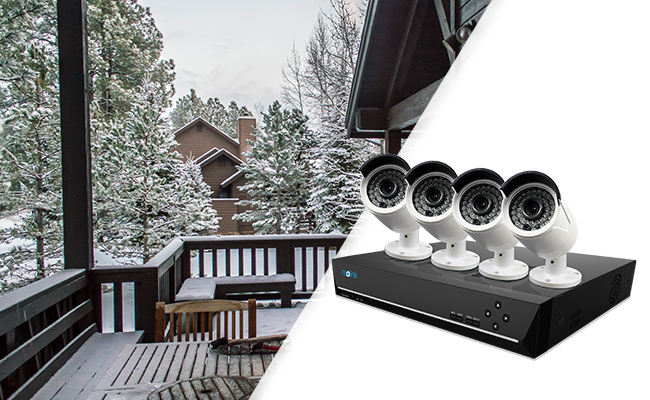 To help you choose outdoor PoE security cameras easier, we share some of the popular and best outdoor PoE cameras and systems. If you want an affordable outdoor PoE security camera with high quality, pick this one. This camera can produce legible images, like someone walking by at night. You can mount this outdoor PoE camera on the brick wall to monitor comings and goings. Here is a car accident captured by this outdoor PoE security camera. If you are looking for an outdoor PoE security camera that is vandal-resistant, and wanna install it on your front door or back patio, this one is the best bet. With IP66 waterproof and IK10 vandal proof, this camera can prevent the lens from becoming damaged or destroyed when there’s maltreatment or physical abuse. You can read this outdoor PoE IP security camera review for more details. You could also connect this PoE camera to the Reolink PoE NVR for 24/7 monitoring and recording. 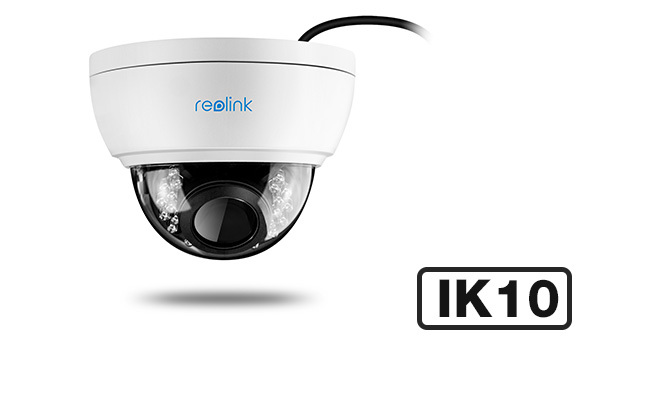 Reolink RLK8-410B4 — one of the best outdoor PoE security camera systems, comes with four 4MP or 5MP PoE IP RLC-410 cameras and an 8-channel NVR with built-in 2TB HDD for 24/7 recording. You can install this Reolink RLK8-410B4 home security system to cover front door, backyard, side doors, driveway, or garage, etc. to get all-around security. You could find many user reviews of this PoE security system both on Reolink website and Amazon. If you are looking for more than a PoE camera system with more than 4 cameras, RLK16-410B8 is one of the highly-rated PoE security systems available on the market. In doing so, it helps get the cameras out of the reach of passers-by or strangers. Meanwhile, it’s common to put the PoE NVR into a locker or server cabinet to avoid damage or theft. In deciding ideal placement location for PoE security cameras, you could draw up your house’s layout and learn the field of view (FOV) of PoE security cameras. When placing PoE outdoor cameras on the soffit, you could run your Ethernet cables through the attic to avoid messy wiring or having your cable accessible or vulnerable to damage. You can check the below step-by-step guide to install your outdoor PoE security camera systems. Note: Other detailed components haven’t been listed here. Here we’ll take RLK8-410B4 outdoor PoE security camera system to show you the detailed cabling and installation steps. Step 1. Drill several suitable holes with the mounting template comes with the security camera system package. Step 2. 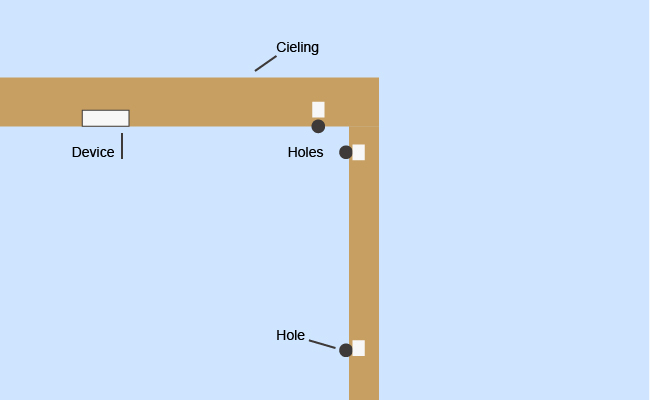 Mount the outdoor PoE cameras to the wall or brick. Step 3. Connect the camera to the NVR with the Ethernet cables. You can use the Ethernet extension cables to boost the connection distance between the cameras and NVR. Step 4. Run the Ethernet cables smartly. You can just drill a hole to run the Ethernet cables from the cameras to the NVR. You can put the wires into the junction box to avoid dangling wires. If you need to install the PoE IP cameras out in the open areas like a pole, deck, pier, or other outdoor locations, make sure the cable connector is waterproof by using cable connector waterproof lip or using plastic conduit. You can also read this step-by-step guide on how to run security camera wires for more details. Step 5. Connect your NVR to your router. Step 6. 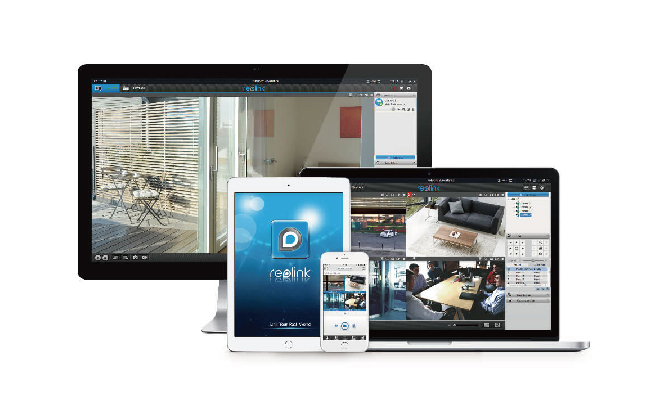 Install and launch Reolink Client and App on your computer and iPhone or Android smartphones. The system will be automatically added to your device as long as your device and the system are connected to the same router. A customer shared his detailed steps on installing this outdoor PoE security camera system. You can watch the below video below. If you have any questions about outdoor PoE security cameras, please leave them in the comment below. This entry was posted in Buyer's Guide and tagged best outdoor poe camera, poe camera outdoor, poe security camera. Hi Brian, please contact our support for more assistance support@reolink.com. If there is anything that you might need, feel free to leave your message here. Could you recommend me Cat6 cables for the RLC-410 camera? I found this Vertical Cable Cat6 dual jacket from Amazon and there’s also the gel-filled version. Which would you recommend for outdoor use? Hi there, for outdoor use, we’d suggest using gel-filled version. If a PoE box is purchased with a system, why must we have a PoE Injector (as mentioned above). The Injector seems unnecessary if a box is used. Hi, Stan, yes, for outdoor PoE camera systems with NVRs, you don’t need extra PoE injectors or PoE switches. You can connect cameras directly to the NVR for the setup. Very well explain about outdoor IP Bullet security cameras, Matrix Security Solutions launch the new range of Outdoor bullet IP Camera Equipped with a back illuminated sensor with exceptional low light performance, to the extent that it produces color images at light as low as 0.08 lux. I need to replace a similar system to the Reolink, but from another manufacturer. That system has hardware reliability issues, but my main complaint is with the software for remote operation of the NVR from a computer, not a phone. Is the Reolink ‘friendly’ in this regard, in that playback of specific times/events can be done from a PC? Hi, Jim, Reolink offers user-friendly and intuitive software /software-and-manual/ for you to remotely operate cameras and NVRs on computers. 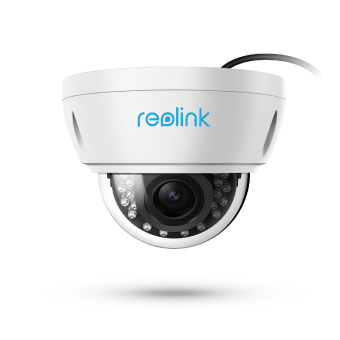 After installing Reolink Client from our website on your PC, you can remotely access the cameras and play back specific events from PC. Hope this helps. I’m a little confused about the need for a PoE injectors and PoE router. Are these needed if you are going to use the NVR? Also, what outside camera would be good for area near Pittsburgh, PA.? We don’t get below 14F a lot but it does happen. We’ll sometime get down around -10F on occasion. 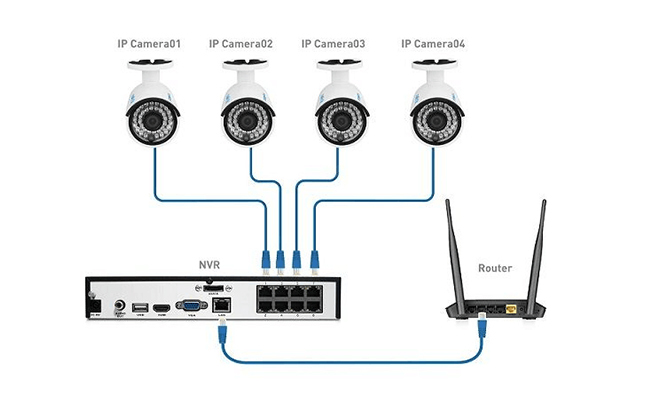 Hi, Sean, you don’t need a PoE injector for PoE IP cameras if you are going to use an NVR. But if you want to receive instant motion alerts or watch live viewing, you need to connect the NVR to a network router. Currently Reolink’s outdoor IP cameras can work well from 14°F to 131°F. You may start the security cameras indoors first and then move the heated cameras outside, which is proved useful and feasible by many users. Hope this helps. Will the 16CH RLK16-410B* support both wired PoE and Wireless cameras? I’d like to be able to use a combination of both to avoid having to run extended ethernet cables underground to a detached garage and workshop. 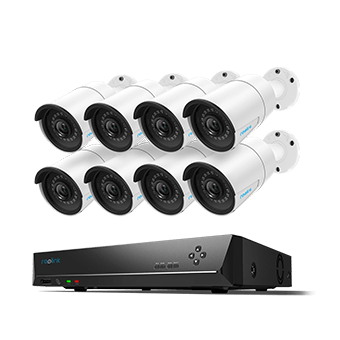 Hello there, the 16 channel system RLK16-410B8 supports both Reolink’s PoE and WiFi security cameras. You may check here https://support.reolink.com/hc/en-us/articles/360007011053-Add-Reolink-IP-Cameras-to-Reolink-PoE-NVR to learn how to add wireless security cameras to Reolink NVR. Hope this helps. Can I use a POE switch to plug the cameras into so that I only have to run CAT6 from the switch to the NVR? Would also like to put cameras in a remote building with a POE switch then one CAT6 back to the main loction. Hello, there, yes, you can use a PoE switch to plug the PoE security cameras and run only Cat 6 Ethernet cable from the switch to the NVR. Also mind that you should run the security cameras within the maximum length of 300 feet to avoid power drop and unstable data transmission. Hope this helps.